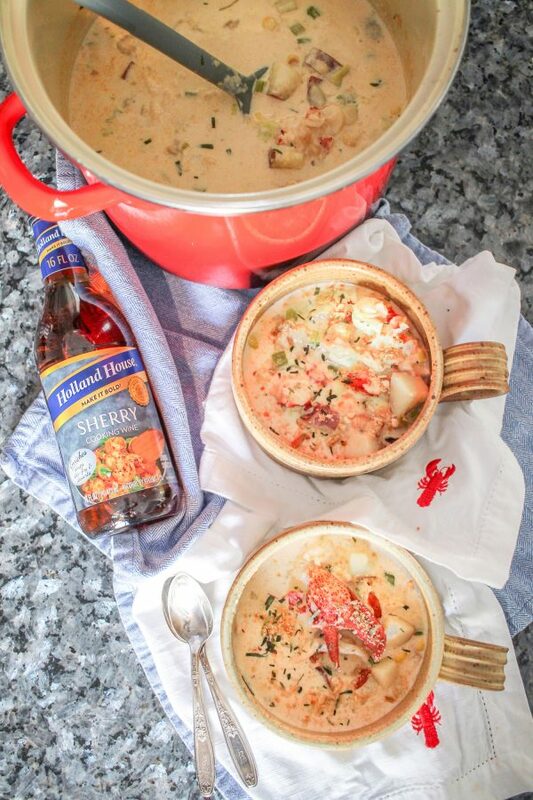 This recipe for Lobster Corn Chowder with Sherry was sponsored by Holland House Cooking Wines, as always the opinions expressed are my own. 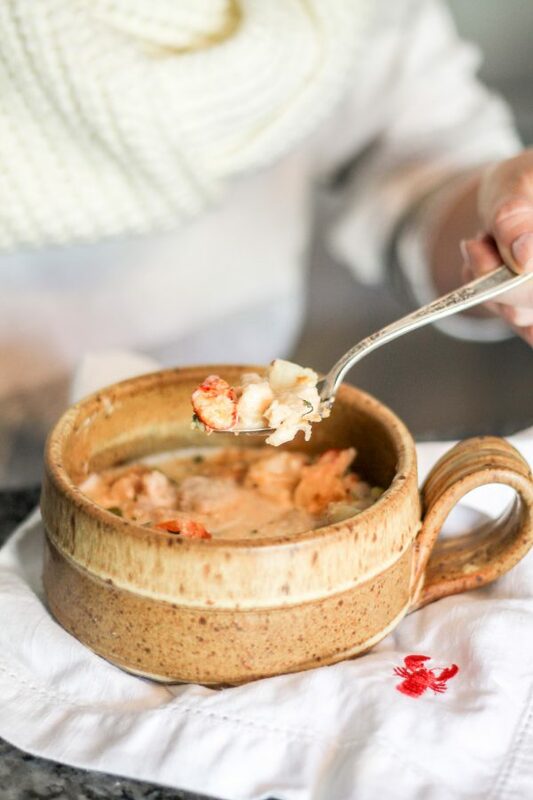 Today I am teaming up with Holland House Cooking Wines to share my Mom’s award winning recipe for Lobster Corn Chowder! 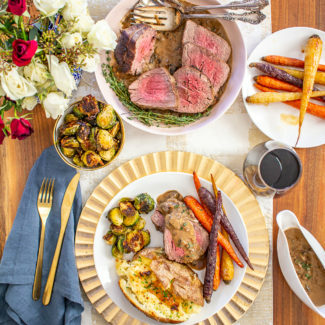 This spectacular recipe is easy to prepare and promises to be a big hit with friends and family. 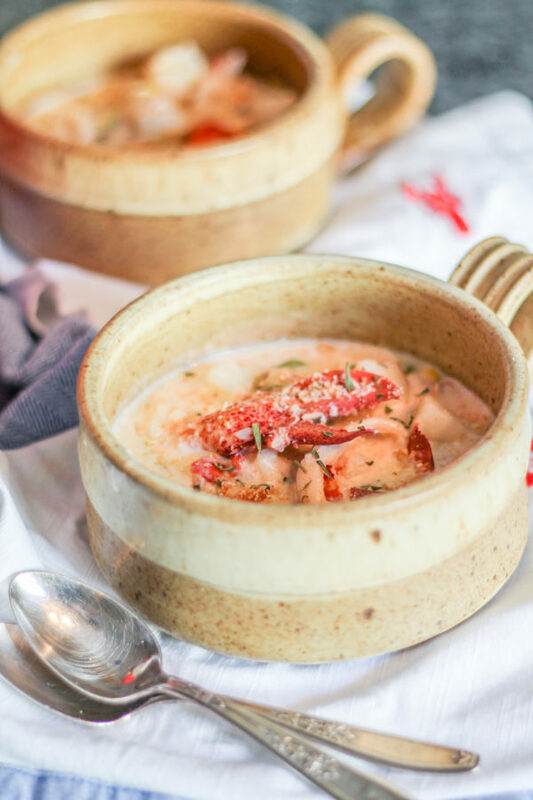 Homemade Lobster Corn Chowder is a rich creamy decadent chowder with chunks of lobster, plenty of corn, diced red potatoes, and a hint of sherry. 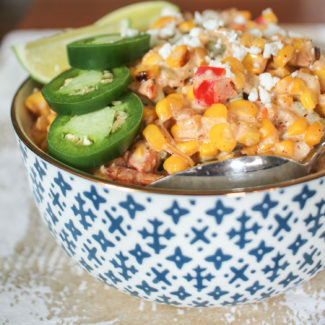 The sherry adds a burst of flavor while the corn gives a crispy freshness. It was the perfect treat to make when we were in Maine. My husband Charles and I spend every Thanksgiving at my parent’s home in Kennebunkport, Maine. Getting to spend every Thanksgiving with my family is one of the perks of marrying someone who isn’t American. While Charles is a city boy who initially seemed a bit out of place in my tiny seaside hometown, he has embraced the local culture. He even wears flannel! 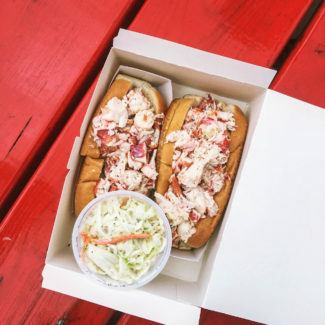 His favorite part of visiting Maine is the lobster. We can’t visit Kennebunkport without eating lobster a couple of times during our trip. 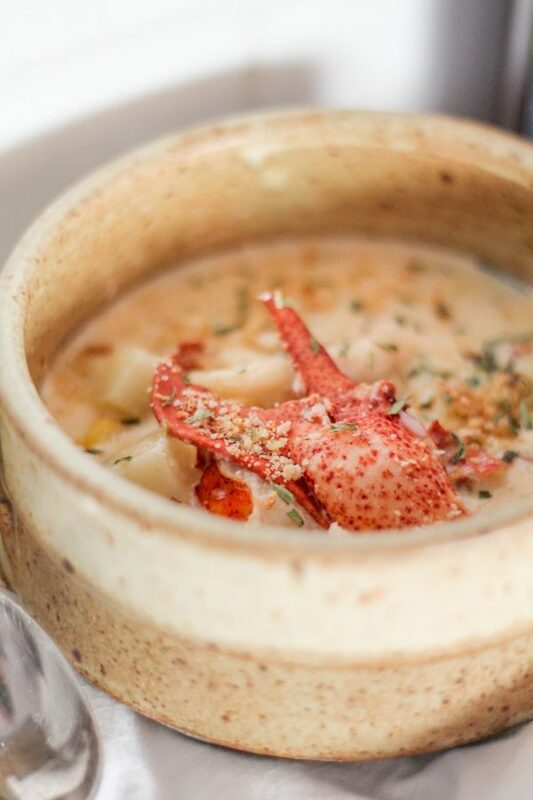 Last time we visited Maine, my Mom taught me how to make her Lobster Corn Chowder, which was the Maine state winner in a regional cooking contest. 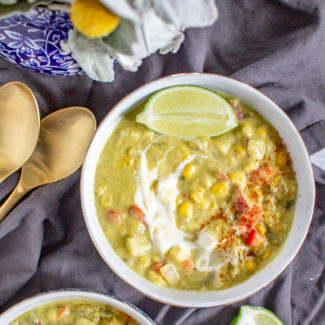 I was surprised at how easy the recipe is, it took under 30 minutes to prepare from start to finish. 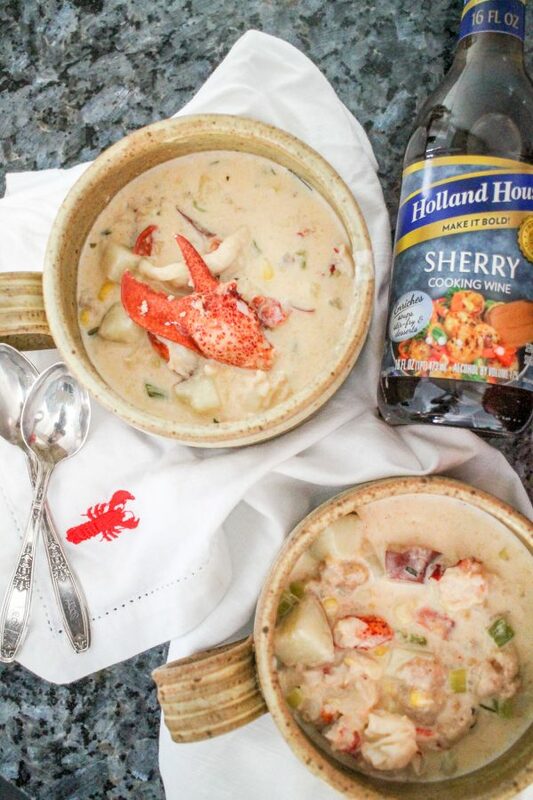 The Holland House Sherry Cooking Wine really stands out and complements the tender lobster. 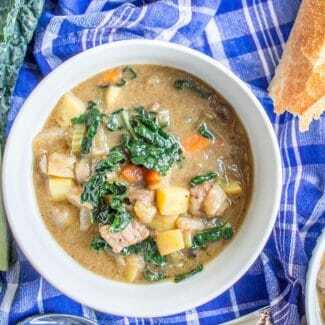 It prevents the chowder from tasting too strongly of creamand it takes the recipe to a whole new level. One trick that my Mom taught me is to buy lobster meat that is picked and out of the shells instead of whole lobsters. 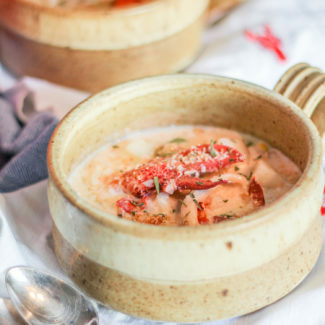 It saves me the time and effort of steaming the lobsters and most importantly, I don’t have to deal with the tedious task of removing the meat from the shells. The price for lobster meat depends on where you are, but this is one of my favorite cooking hacks. 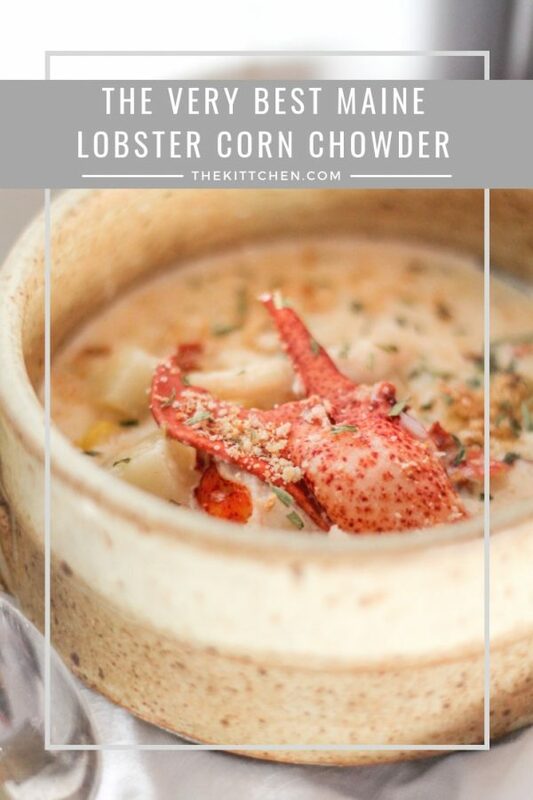 If you are looking for an easy but special recipe to prepare this holiday season, this Lobster Corn Chowder is just the thing. You can even make this a day ahead. 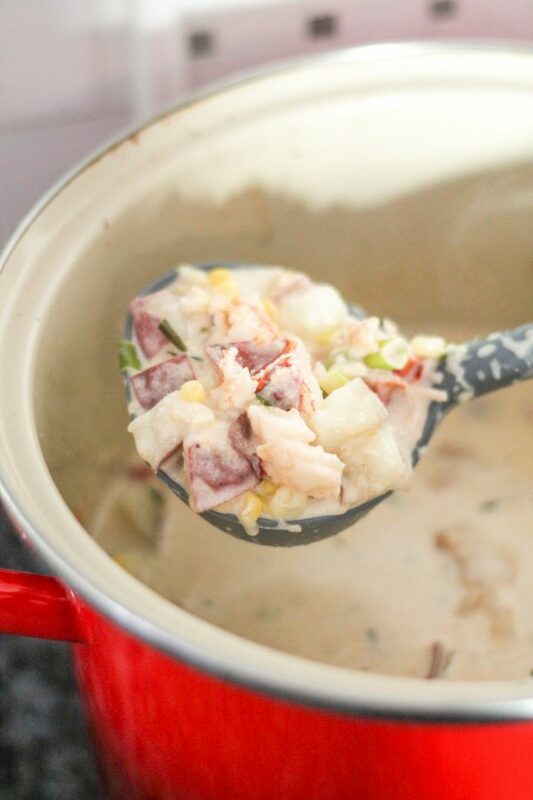 Homemade Lobster Corn Chowder is a rich creamy decadent chowder with chunks of lobster, plenty of corn, diced red potatoes, and a hint of sherry. 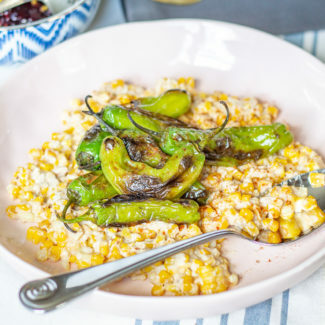 The sherry adds a burst of flavor while the corn gives a crispy freshness. First, dice the potatoes. Place the potatoes in a large pot and barely cover with water. Boil the potatoes until tender, this will take about 10-12 minutes. While the potatoes are cooking, dice the celery and chop the scallions. Chop the lobster. Place the crackers in a plastic bag and use a mallet to crush into crumbs. Set aside. Once the potatoes are tender, drain them leaving only a slight amount of liquid (about 1 cup). Melt the butter in a skillet over medium heat. Sauté the diced stalks of celery. When tender, add scallions and corn. Let cook for 4 minutes. Add 6 cups of whipping cream to potatoes and heat over medium heat. 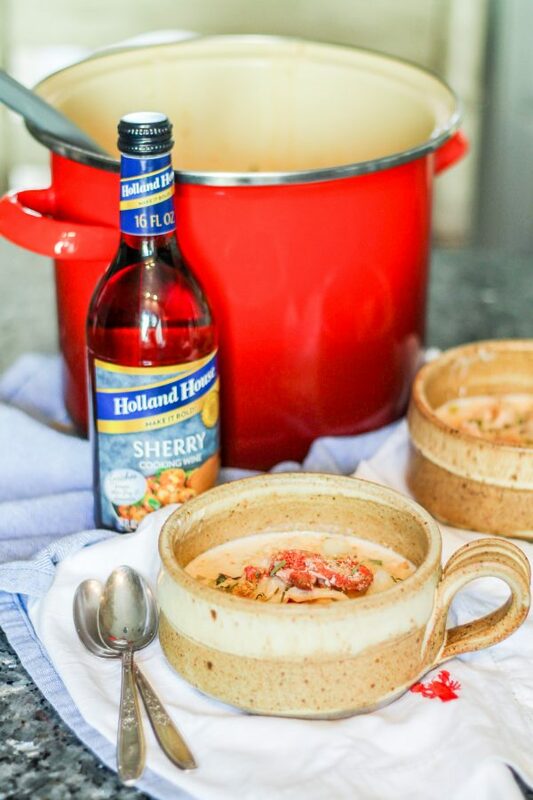 When warm, add 1 cup of Holland House Sherry Cooking Wine, paprika, and tarragon. Then add the celery, scallions, corn, lobster, and powdered crackers. Heat the soup until it slowly bubbles, then serve.